PLANET ENW-9740P is a 4-port 10/100/1000T 802.3at PoE+ PCI Express server adapter with a maximum of up to 120 watts of power output over Ethernet cables. 95W is suggested, depending on usage. 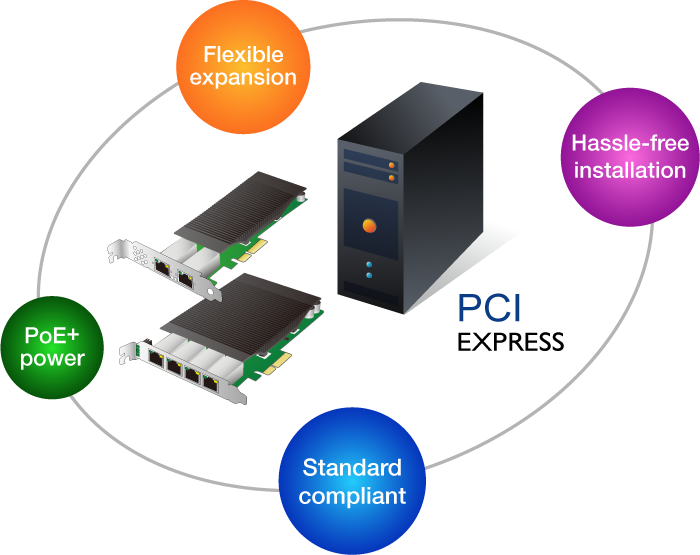 Complied with PCI-E standard, the ENW-9740P can be installed on any IPC or server motherboard with PCI-E socket to make the IPC or server able to communicate other Ethernet devices and deliver power to PD devices. Each port of the ENW-9740P can deliver 30W of power and 1000 Mb/s bandwidth over a networking cable of up to 100 meters. Its 30W PoE+ can now power not only PTZ (pan, tilt and zoom) cameras for surveillance applications but also 802.11ac AP for ultra-high-speed wireless application. PLANET ENW-9740P is backward compatible with both IEEE 802.3af/at PoE standards which allow users to flexibly deploy standard and high powered devices to transfer data and power simultaneously through one Ethernet cable for up to 100 meters. 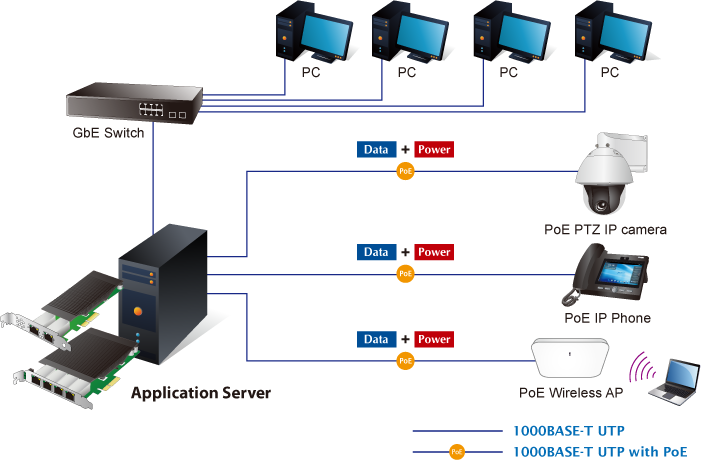 With PoE application, the ENW-9740P frees the IP camera and wireless AP deployment from restrictions of power outlet locations and the additional AC wiring. 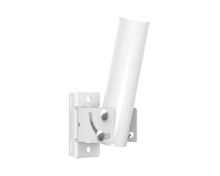 It reduces cables and eliminates the need for electrical outlets on the wall, ceiling or any unreachable place, and most of all, it reduces installation time. The ENW-9740P supports IEEE 802.1q VLAN which allows it to operate in a flexible and secure network environment. 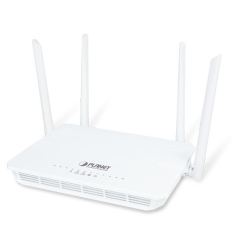 With 9.5K jumbo frame ability and IEEE 802.3 flow control support, it further optimizes throughput and wire-speed packet transfer performance without the risk of packet loss. The high data throughput of the device makes it ideal for most Gigabit Ethernet environments. The ENW-9740P operates completely well with most of the popular and latest operating systems including Microsoft Windows Server, Linux and VMware, enabling simple integration into network designs. There is no need of any modification to the server's operating system or any special software required for the ENW-9740P to be integrated into the system. The PLANET ENW-9740P is designed with Intel® I350 server-grade GbE controller which provides high-performance, quad-port Gigabit network connectivity. It not only supports 9.5K jumbo frame and 802.11q VLAN to enable higher and better throughput of data but also enhances data acceleration across the platform (network, chipset and processor) to reduce CPU utilization. In addition, its single-bus, quad PoE ports capacity delivers up to 30W power per port. The ENW-9740P can easily act as a server NICs of your networks by wiring to the backbone switches and is right for the main board with PCI Express now and in the future. 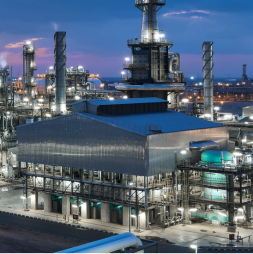 The ENW-9740P is a highly cost-effective solution to deliver Power over Ethernet function to meet the requirement of the industrial field such as IP surveillance, IP phones and WLAN application.